There has been a surge in kayak sales and in particular kayak fishing over the past couple of years. Kayaks are a great way to get into tight spaces with skinny water where the fish might be hiding but not without it's limitations. Protecting your rods while kayak angling, the Rod Glove keeps your guides from getting chipped and your rods from getting tangled during transportation. Kayak angling has grown rapidly in popularity and it's a relative inexpensive way to go from shore fishing to on the water. There are many challenges fishing from a kayak unlike a boat. Being close to the water creates challenges for casting, and catching as it is slightly less stable and at times can mean casting with one hand. With many accessories on the market, the options abound with attachments that make it easier for kayak anglers to get out on the water comfortably. 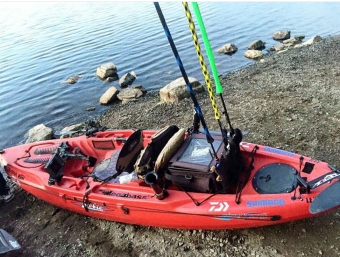 One of the issues with kayak angling is getting your gear safely to the boat launch. Since storage is key on a kayak, the most common way to hold rods on the yak is in a rod holder. Unlike a boat, this means that your rods need to be transported and the Rod Glove keeps your rods and reels protected during transportation on and off the water. If you are willing to put in some time on a kayak, you will certainly get an understanding of what draws so many to the sport. Without the noise of motors, you are able to escape to nature and relax while having a chance to catch some fish that you might not otherwise had seen. With many manufacturers offering a variety of fishing kayaks, it's hard to know which one is best suited for yourself. Many outfitters have open houses in the spring season and demo days in which you can try a kayak on the water to see if this is something that you will enjoy. Be sure to take along The Rod Glove to protect your rods and reels and enjoy yourself on the water.